Capcom announced that it will broadcast a Monster Hunter: World 'Special Developer Update' that is a pre-recorded video presentation. The video Presentation will begin at 6:00 a.m. PST / 2:00 p.m. GMT on December 10, 2018. Special Developer Update will stream on twitch and youtube. 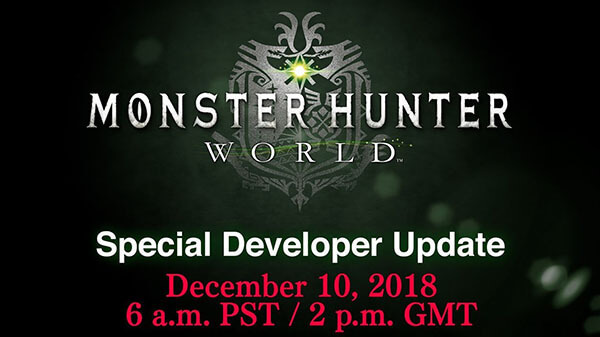 "Our Special Developer Update will feature producer Ryozo Tsujimoto giving you the latest news about Monster Hunter: World! Thanks to all of you, Monster Hunter: World has shipped over 10 million copies worldwide, and in January 2019 we'll be celebrating the anniversary of the game's release, so don't miss out on this latest update! - The broadcast will begin at 2 p.m. (UTC) on December 10, 2018. - Broadcast time and contents are subject to change without prior notice. - The Special Developer Update is a pre-recorded video presentation. - The video is about 15 minutes in length. Ryozo Tsujimoto (Producer, Monster Hunter: World)"